Seventy-nine. In the same year the Folger Shakespeare Library turns seventy-nine years old, it updates a number that since the founding of the library has helped define the strength of its collection. It’s the number that was found on all the brochures, ads, encyclopedia articles, and websites. Seventy-nine was, until a few months ago, the official number of First Folios held at the Folger. Printed in 1623, the First Folio was the first collected edition of Shakespeare’s plays. 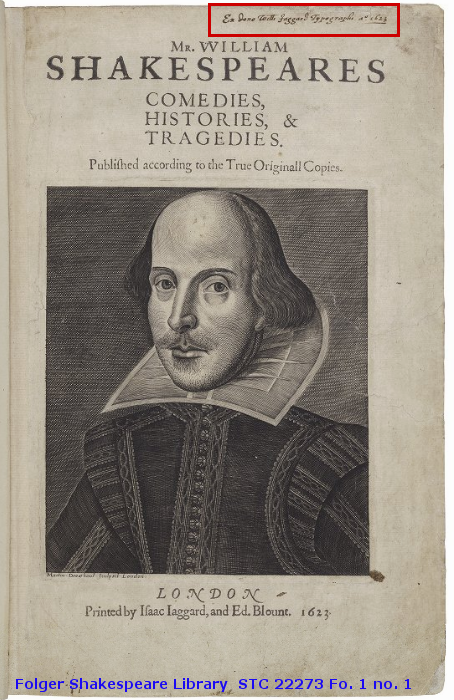 Not only did it preserve eighteen plays that had not yet been printed, the portrait on its title page remains the most iconic representation of Shakespeare. Over the centuries the First Folio has become one of the most famous and valuable books in the world. While the Folger’s founders, Henry and Emily Folger, acquired a rich collection of artifacts related to Shakespeare and his time, their great love was clearly the First Folio. Sometime around 1924, Henry Folger began numbering his First Folios. The numbers were not random, but were based on his assessment of a combination of their value, condition, and completeness of the copy. For example, First Folio no. 1 is a presentation copy given posthumously from the book’s printer William Jaggard to Augustine Vincent, an author with whom Jaggard had worked the previous year. Because its provenance links the book directly to the printing house, Henry Folger gave it the distinction of being Folger First Folio no. 1. From there the books were numbered to no. 66, an incomplete copy of 169 leaves (out of a possible 445 text leaves). As Henry Folger acquired new First Folios, he continued numbering from no. 67 upwards, based primarily on when he acquired them, even though a few of the copies were befitting of a much lower number. This page from Henry Folger’s typed acquisitions notebook shows his First Folios numbered from 1 to 66. 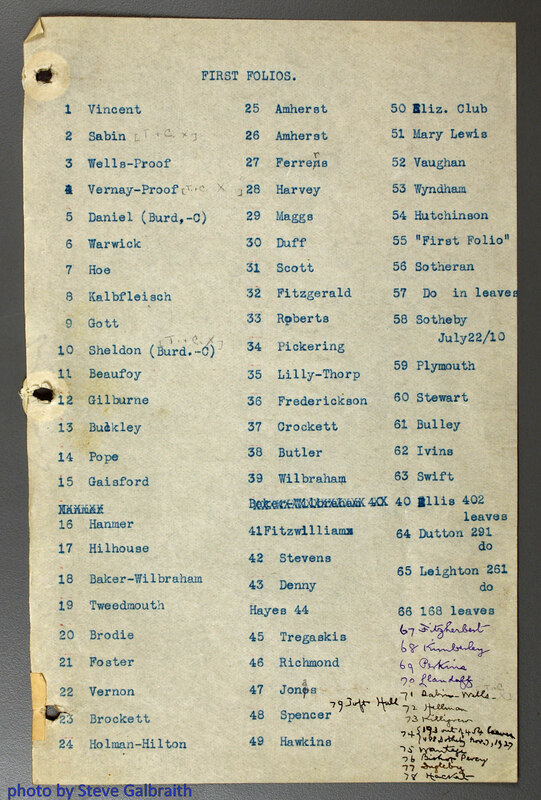 Manuscript notes likely belonging to Giles E. Dawson, the Folger’s first Reference Librarian and Curator from 1946 to 1967, finish the list with numbers 67 through 79. All told, the Folgers counted seventy-nine First Folios. Thus, this became the official total. This number, however, did not take into account sets of fragments acquired by the Folgers that, although not bound as single volumes, were in some cases more complete than copies counted in the seventy-nine. Questions about how to treat the fragments led to debate over just how many First Folios the Folger Shakespeare Library owned. Peter W. M. Blayney, The First Folio of Shakespeare (Washington, DC: The Folger Shakespeare Library, 1991), 46. Antony J. 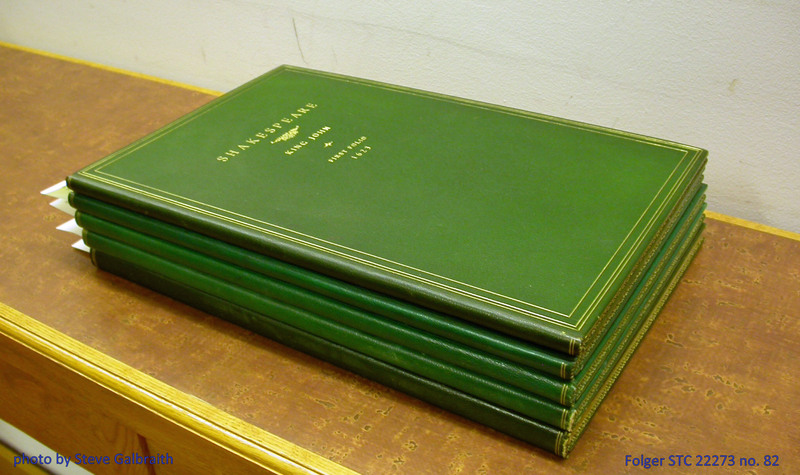 West, “How Many First Folios Does the Folger Hold?” Shakespeare Quarterly 47.2 (1996), 190-194. Steve Galbraith was the Andrew W. Mellon Curator of Books at the Folger Shakespeare Library until September 2011. Thanks for pointing out the coincidence of the formerly-canonical 79 changing during the Folger’s 79th year! I’m embarrassed to admit I hadn’t noticed that.